After a breakfast of blueberry pancakes, courtesy of George, George and I took a 1.5 mile walk around the neck that led us over the rocks, along the beach, and on a boardwalk through a bird sanctuary. The rocks we passed inspired Winslow Homer who owned a home and studio nearby in the late 1800’s to paint The Canon. It is said that during high tide, the water sprays from the rocks like a canon, thus the name. My first stop on the coast of Maine was Bailey Island. I crossed the Cribstone Bridge, supported by large granite blocks stacked in a checker board pattern so that the water may flow through the open spaces, to see the Pearl House, once the summer home of Harriett Beecher Stowe. I never found the Stowe house, but did see some stunning harbors and inlets. I returned from Bailey Island to Bath. I thought I would pick up a few geocaches there since I had good cell service. One turned out to be an end to a challenge of finding several others and the other appeared to be down a steep embankment covered in trash near the railroad tracks, so I resolved to wait for a better time to add Maine to my list of geocache states. While I wasn’t successful in geocaching, I enjoyed walking around Bath’s historic district and attempting to get a look at Bath Iron Works, a defense contractor that continues to build ships on the coast of Maine. I traveled on to Fort Popham, a pleasantly surprising historical site that lay on a peninsula jutting out to sea. The Fort of the civil war era was built but never completed in 1861 to protect the ship building interests of Bath upriver. It sat next to a short walking trail, fishing pier, and picnic site. I really enjoyed the short time I spent at this fort on the coast of Maine. I continued on Highway 1 to the next turnout at Reid State Park…most of the stops are an out and back trip on a side road to the coast of Maine. Trails wound by rocky shores, beaches, and marshes while rosehip grew abundantly nearby. As I’ve mentioned several times, no state park campsites are open in Maine, thus I needed to find a Walmart parking lot to rest for the night. Along the coast of Maine, there are only two. One near Rockland and the other near Ellsworth, over 150 and 300 miles away from my starting point, respectively. 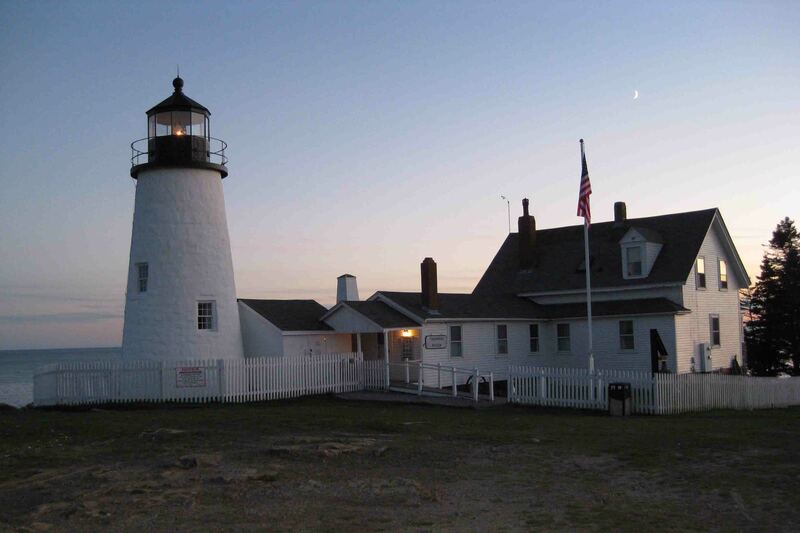 At 5 pm, I determined I was a little over an hour away from my night’s “campsite”, so I made two more quick stops: one at the Lincoln County Courthouse in Wiscasset and the other at the Pemaquid Point Lighthouse. As expected, the courthouse was closed, but it was right on the highway, so I just strolled around it. I picked up the pace to try to get to the lighthouse around sunset. The sunset filled the sky with brilliant oranges, and the photo opportunities of the famous lighthouse on the coast of Maine were outstanding. This lighthouse has functioned since 1827. It was cool to see the light fade off and then illuminate. I love blueberry pancakes. Next time you have some, fax a few my way!! Safe travels and great job on your blog!! will do…muchas gracias…hope all is well with you! love the pics of the lighthouse, beautiful. If I have time, I might try to go back there during the day. I liked that spot.